Permanent SEPARATION of water & oxygen from metal. While RustSeal will indeed provide superior rust protection when coated directly over a minimally prepared surface, only KBS Coatings' unique 3 Step Oxygen Block System offers the proper surface preparation and unmatched ability to Stop Rust. 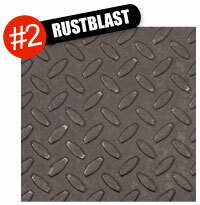 RustSeal - a one part, ready-to-use, high-solid content, rock-hard, paint over rust coating. KBS Coatings products are designed to work as a COMPLETE SYSTEM. 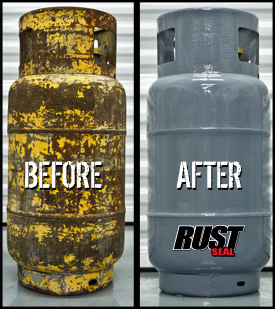 While RustSeal will indeed provide superior rust protection when coated directly over a minimally prepared surface, only KBS Coatings' unique 3 Step Oxygen Block System offers the proper surface preparation and unmatched rust stopping power. When used together, these products provide you with a coating that will not only STOP RUST, but will protect it from returning. To aid you in your particular rusty metal project, we have included the following steps to explain the various stages in rust prevention. For an overview of the KBS 3 Step System, be sure to also check out the KBS Flow Chart. AquaKlean should always be diluted with water. For general purpose cleaning, apply liberally and wash surface for 5-10 minutes. For heavy-duty cleaning, extended soaking times up to 24 hours or more may be necessary. Use a bristle brush or scouring pad to expedite the cleaning of heavily soiled surfaces. Retreat surface as necessary until clean. 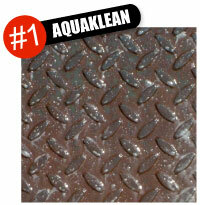 Do not allow AquaKlean to dry before rinsing. Rinse thoroughly with water after cleaning and let dry. Liberally apply RustBlast FULL-STRENGTH to a DRY surface using a spray bottle, brush, roller, or backpack sprayer for larger applications. Re-apply often and as needed to keep the surface wet for a minimum of 10 minutes for smooth or lightly rusted surfaces, 20-40 minutes for moderately rusted surfaces and 1-2 hours for heavily rusted or corroded surfaces. DO NOT allow surface to dry. After treatment, rinse thoroughly with water and then allow surface to dry completely. 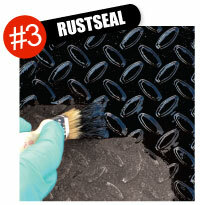 Apply RustSeal to prepared surfaces by brush, roller, or spray equipment. Brush marks will level out as if sprayed. Always apply a MINIMUM of 2 full coats (2 mils each) for general applications. For marine or industrial applications, apply a minimum of 3 full coats (3 mils each). 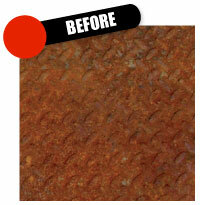 Recoating can be done once the first or consecutive coat is dry-to-touch. 1-877-548-9323 KBS Coatings - Rust Stops Here.